I made steamed “kueh”, or dumpling, a long while back using glutinous rice flour but the skin of the kueh turn out too soft. This time around, I got this recipe from my friend and neighbor Angela, as she gave me some steamed kueh and I found her kueh has a slightly chewy skin that I prefer. Needless to say, I quickly asked her for the skin dough recipe. Things I do differently this time: I placed the kueh on cut-out parchemnt paper, instead of greased cut-out banana leaves– and the kueh don’t stick to the bottom paper at all. Also, I don’t brush kueh skin with oil after steaming. For the filling, you can make anything you want, as long as it is cooked. I have tried on shredded daikon and jicama, and both times turn out pretty good. Steamed “Kueh” Dumplings with Shredded Daikon filling. I used banana leave as liners for this batch. 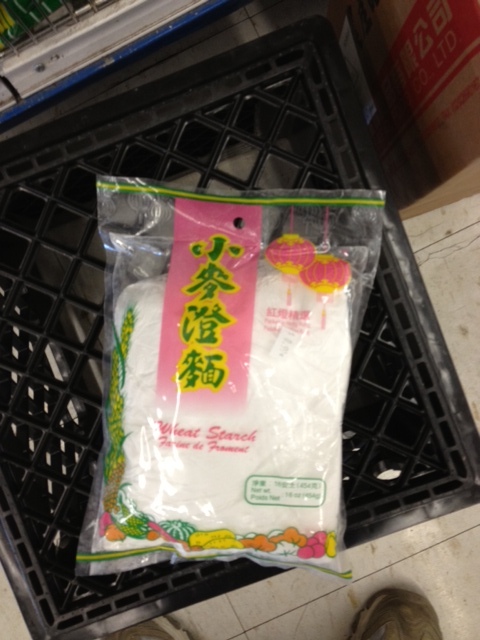 Mix flour and wheat starch together in a big bowl. Add in hot water and oil to form a dough. Knead the dough until it is smooth. Add more hot water, little at a time, if the dough is too dry. Divide into 20 pieces. Divide filling into 20 portions as well. Roll out each piece of dough to about 4-inch circle. Spoon in one portion of shredded daikon filling, fold up dough skin and pinch to seal the edge. 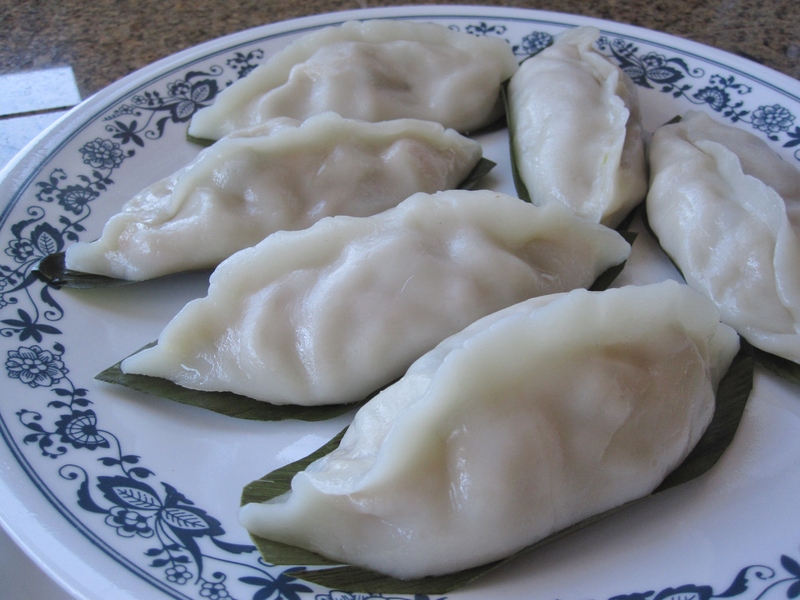 Place the kueh/dumpling on a piece of parchment paper (sealed side facing up), or lightly greased banana leaves. Repeat with the remaining dough and filling. 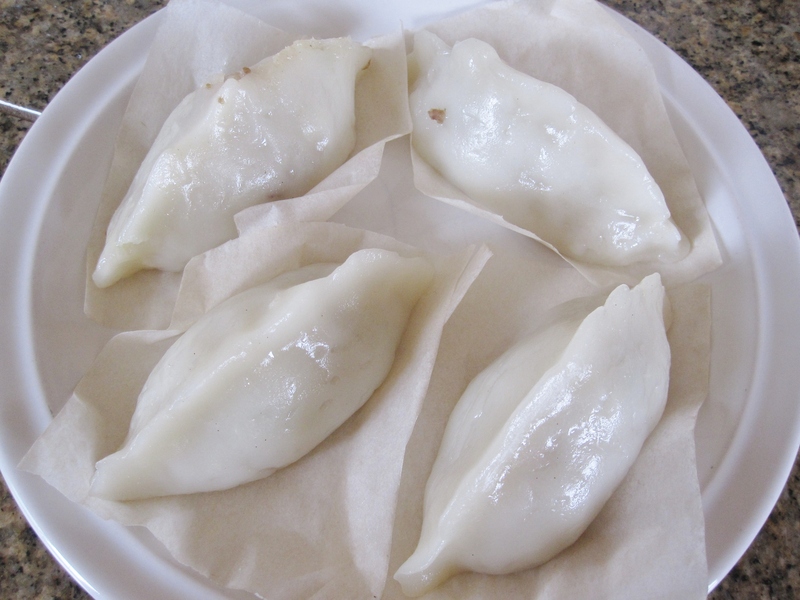 Place several kueh/dumplings inside a steamer, and steam on high heat for 8-10 minutes. Be sure not to put too many dumplings in one batch, so there is room for the steam to come up from the water boiling at the bottom. Put shredded daikon in a bowl and pour in generous amount of salt. Toss and squeeze daikon. Set aside for 15-20 minutes so daikon softened and liquid draws out. Rinse daikon a couple times. Squeeze out as much liquid as possible. Put 3 tbsp of oil into a wok over high heat. When the wok is ready, saute garlic and dried shrimps until aromatic. Add in mushrooms, saute for a couple of minutes before adding in daikon. Keep stirring until it is aromatic. Add seasoning, adjust to taste. Stir and cook until daikon softens, adding some hot water, little by little, if necessary to cook daikon further to soften. Put in chopped green onion. Stir a few more times then dish out and cool. Add in mushrooms and carrots, saute for a couple of minutes before adding in jicama. Keep stirring until it is aromatic. Add seasoning, adjust to taste. Stir and cook until jicama turns soft but still taste slightly crunchy, adding some hot water, little by little, if necessary to cook jicama further to soften. Put in chopped green onion, stir a few more times then dish out and cool. Jicama strips: Unlike dough made from flour, glutinous dough is not very elastic– it crumbs and break apart easily. So it’s better to cut jicama to very thin and shorter strips, so the filling won’t poke through the dough.